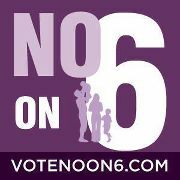 Amendment 6 on this year's ballot is dangerous for women, for LGBT and for the people that love them. We need your help to defeat Amendment 6. Amendment 6 is a direct attack on Florida's privacy laws that are at the heart of the LGBT anti-discrimination laws and a woman's right to make her own medical and reproductive decisions. It would allow politicians to step in between a woman and her doctor; and would prohibit health insurance companies from covering medical procedures necessary to protect a woman's health. Equality Florida is a proud partner in the Vote No on 6 coalition and we are working hard to defeat this dangerous amendment. On October 18, the Vote No on 6 campaign is hosting phone banks to talk to voters about this amendment. Phone banks will be hosted in Sarasota, Orlando, Broward, West Palm Beach and Miami. Please volunteer a few hours to defeat Amendment 6 and protect the victories we have worked so hard to achieve. Click here to sign up for a phone bank. A few hours of your time will make a huge difference.